For the ultimate in a great looking safari rack at top quality, we offer racks by Garvin. Manufactured from 3/4" HD steel tubing. The picture on the left shows our most popular Expedition Wilderness rack kits with the super full length 'long rack'. And the middle length kit more commonly known as the 'short rack'. Both of these racks will nearly double your cargo capacity from the interior of the Cruiser. 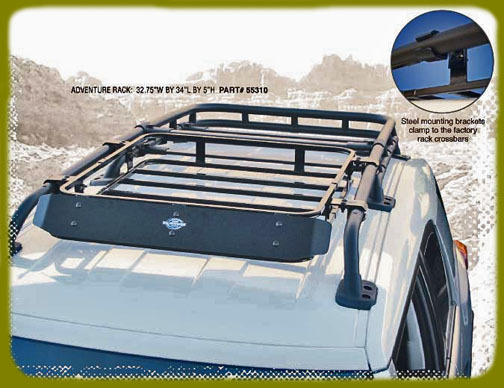 The Wilderness FJ Expedition Rack mounts to existing holes in the roof of the hard-top, with no drilling required for installation. It is made from heavy duty 3/4" square steel tubing, and it easily rated to 300 lbs. either on or off road (we've carried more). The rack was designed to contour the roof for a more stylish look, and includes a sloped front end to easily mount our wind deflector (#29974). 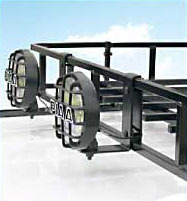 The rack is black powder-coated for durability, and includes black zinc-coated mounting hardware. (Lights, Hi-Lift jack, and shovel not included). This system uses existing mounting holes and replaces the bulky tube style rails that come from the factory. They really do a good job of streamlining the look of your overall rack system. We carry a variety of rack and mounting systems to fit any FJ owner's needs as illustrated by the racks above and below. All come in the versatile 4" height. They are powdercoated black for a durable lasting finish and excellent looks. 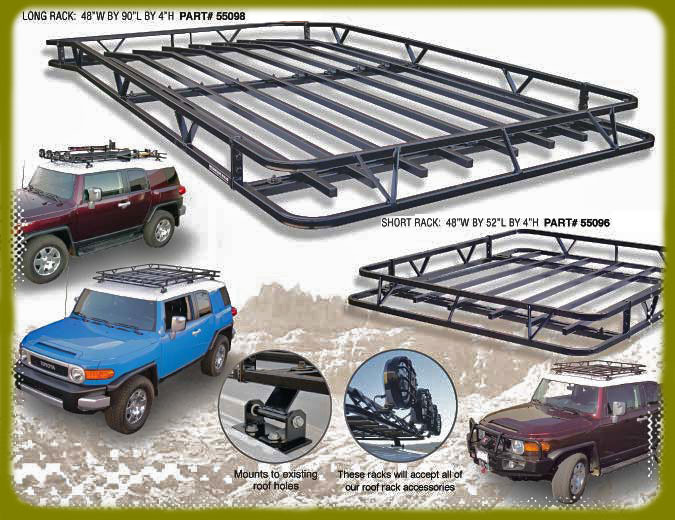 Perhaps best of all... all Wiilderness roof rack systems bolt together to make them UPSable which seriously reduces shipping costs as opposed to other safari racks which must go truck freight at typically double the cost. The simple bolt together system makes this rack a very easy installation for anyone. Not just mechanics and the technically included... but absolutely ANYONE who can operate a wrench. Additionally, all FJ rack systems come with Floor kits included as shown in the pictures. For those that want to keep their Toyota rail system, the FJ Cruiser Adventure Rack which is pictured to the right allows you to gain full functionality of the factory roof rack. It mounts to the front end of the FJ Cruiser rails with no drilling required. Our heavy duty steel mounting brackets clamp to the factory rack crossbars. 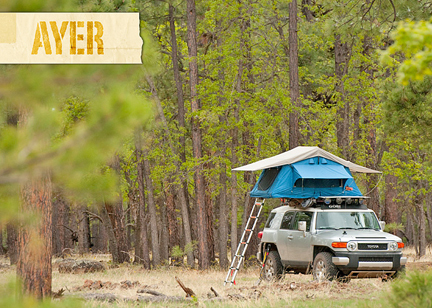 The Adventure Rack holds a great deal of gear and protects your roof at the same time. It is black powder-coated, and comes complete with black zinc-coated mounting hardware. The Adventure rack also INCLUDES a wind deflector to help decrease wind noise, normally associated with the rack systems that attach to the factory Toyota rails. The Adventure rack is a super simple add-on for any FJ owner. 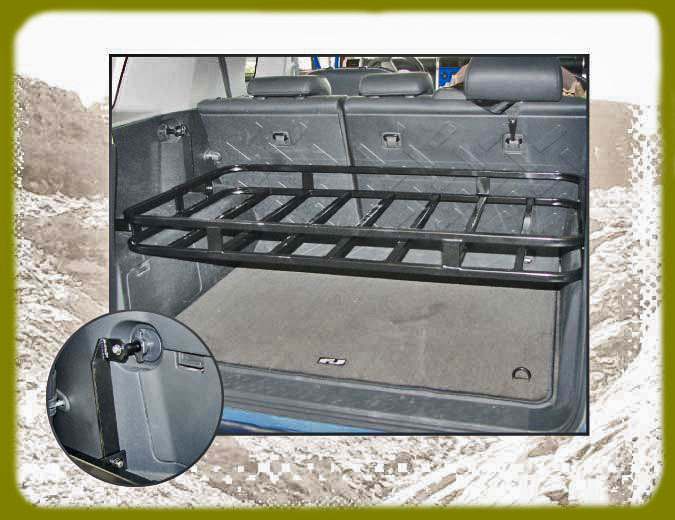 The FJ Utility Rack pictured to the left gives you an extra level of storage in the rear of the Toyota FJ Cruiser. The Utility Rack mounts on top of the wheel wells as illustrated, and to the side panel tie downs. No drilling is required for installation. Once the rack is installed, you still have access to all the factory storage cabinets. 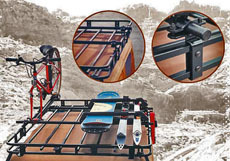 The cargo, luggage and accessory carrying rack is black powder-coated for lasting durability. 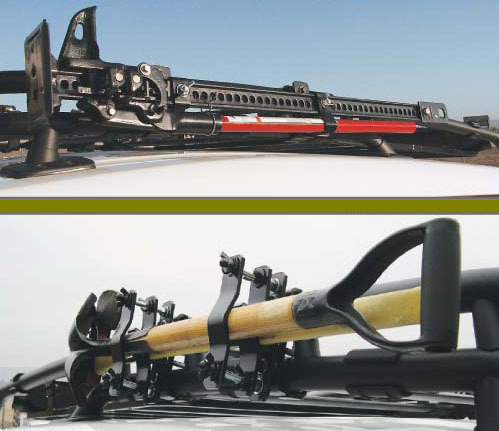 One of the nicest features about any of the roof mounted Wilderness rack systems is the capability to accessorize your rack. We offer a great selection of mounting systems for the Wilderness racks, as well as for the factory Toyota rails as illustrated in the pictures to the right. Scroll down for even more accessories for your Toyota and to view pricing on all these great rack systems and accessories. Are you looking for a place to mount you Hi-Lift Jack or Ax and Shovel, other than inside the cab? Our new accessories solve this issue. 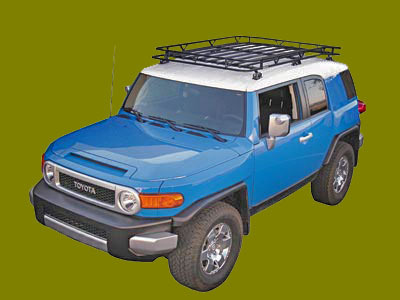 The accessories mount to the factory installed roof rack for the Toyota FJ Cruiser. No drilling is required for installation. All mounting brackets are black powder-coated for durability. Roof rack light brackets are also a great feature we like. Designed to bolt or clamp onto the Wilderness rack, they are powdercoated with grade 5 zinc hardware. Designed to fit any light with a bottom stud mount. Never hit the trail without your trusty axe and shovel... and don't get clobbered or chopped by it when the going gets rough and parts start moving inside your Cruiser. This mount system gives you a solid and safe way to carry your gear if you pick up one of the Expedition Wilderness racks. Yet more cool stuff for your Expedition Wilderness rack. The Hilift mount gives you a great way to carry your jack, with quick and easy access. Also alows you to place a lock to secure your HiLift for duty around town and less secure environments. Very solid and very safe mounting system for this heavy piece of mandatory trail equipment. 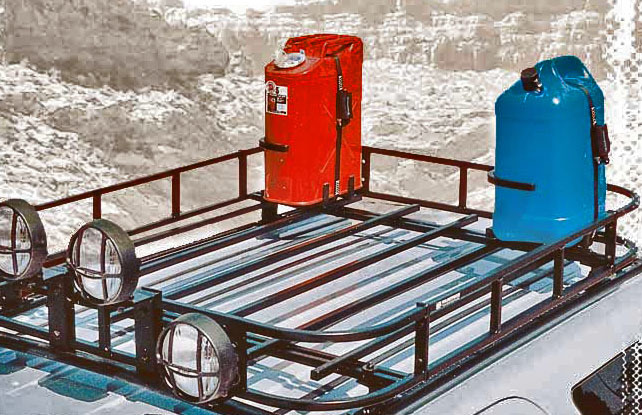 Unique to the Expedition Wilderness rack system is the Gas Can, or Water Can carrier system. This kit allows you to safely and securely carry these containers up top. A great item for the adventurer who finds pleasure in getting away from it all. The strap system is a cam lock that really snugs the container into place. Also unique to any of the Wilderness rack series is the ability to mount Thule and Yakima accessories. We use this system on our own vehicles to carry our Kayaks and Mtn Bikes. 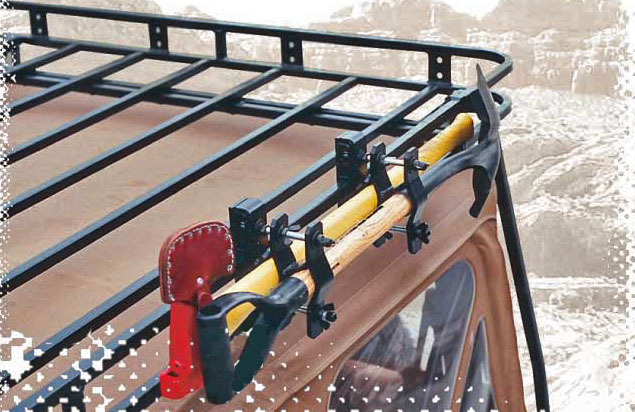 Fits about any accessory as you can see which makes this Safari rack THE MOST versatile setup on the planet. 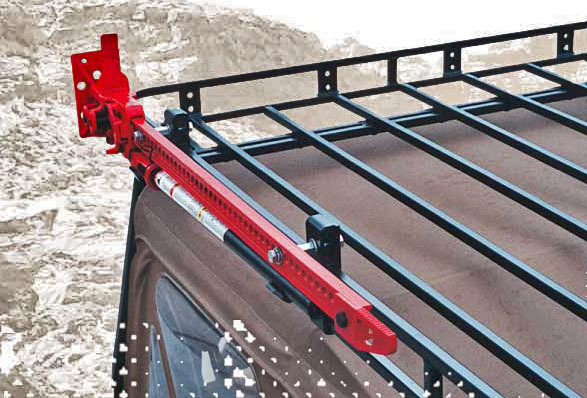 Rocky Road rail and crossbar kits are perfect for use with nearly all Roof Top Tent kits!! We are happy to carry the two best RTT tent kits on the market at this time in kits which will perfectly mount to your FJ Cruiser if using the Rocky Road rack kits... no fishing around for additional mounting pieces or scrambling to whip up your own DIY mounting setup. Rocky Road is very pleased to offer these tent kits, the racks to support them, and also pleased that TEPUI used our rack kits on their own vehicles to display their tents in various sales literature and online. If you go to the Tepui website, many of the photos showing the tents mounted are using Rocky Road rack systems!